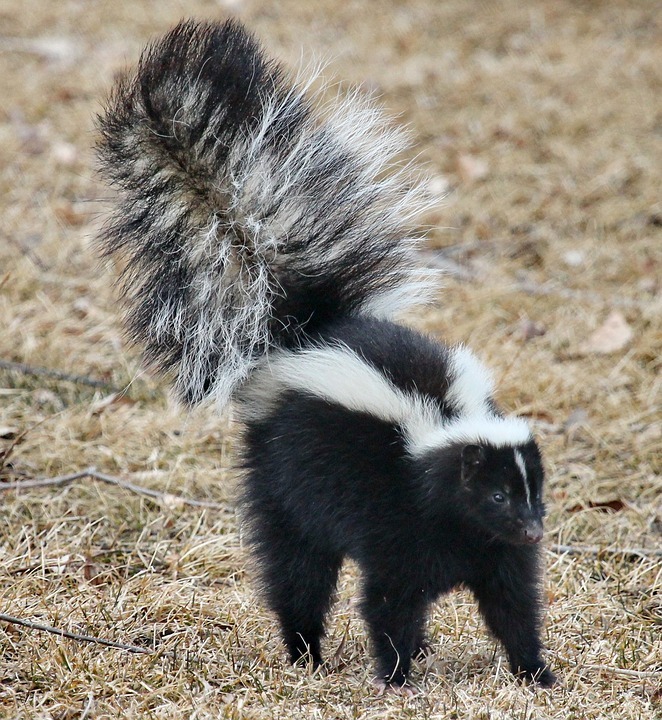 Skunks are notorious for the foul-smelling odor of their spray. There are many different species of skunk in North America, but Ohio is home to only one: the striped skunk. They are usually about 2 feet long, weighing anywhere from 4 to 10 pounds in adulthood. This species is known for their signature black palette and white stripes which run the length of their backs. This extreme contrast in color is known as a warning coloration. Many animals which present some sort of unusual danger, such as deadly poison or the skunk’s spray, are equipped with an unusual coloring which serves as a warning to other animals not to approach them. Skunks are obviously not to be messed with — let us handle them. 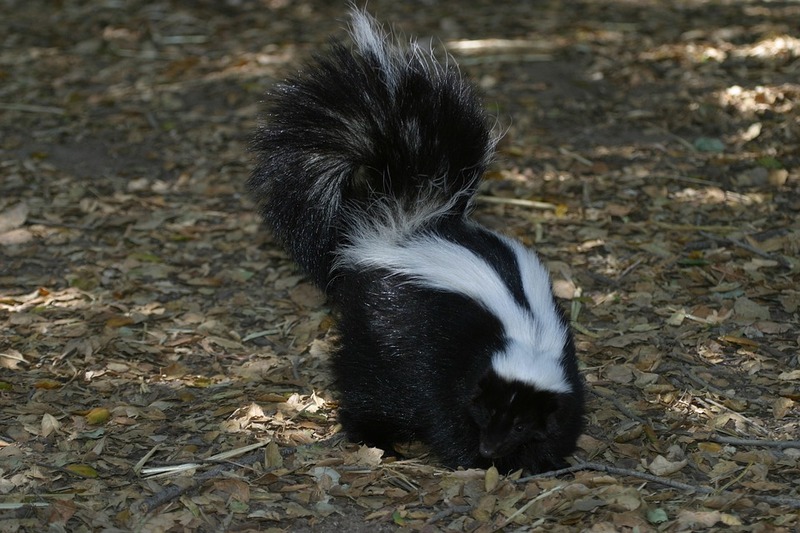 Give Buckeye Wildlife Solutions a call at 844-544-9453 and solve your skunk problem today! Removing Skunks From Your Property. Installation Of Barriers On Your Property To Prevent Further Issues. Skunks are relatively small mammals. They range from 20-25 inches in length, weighing around 1 pound on average. Skunks are omnivores, meaning they will feed on a variety of different foods. This includes fruits, seeds, insects, and sometimes meat. Their diet typically depends on what is seasonally available. Skunks have done an incredible job of adapting in order to survive around humans. 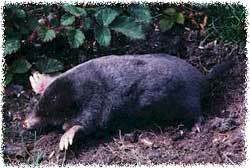 They are fully capable of living under decks, patios, and sunrooms to stay safe from predators and harsh weather. 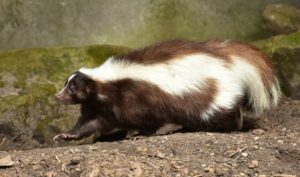 Skunks usually emerge each year around February, causing problems for homeowners all around Columbus, OH and surrounding areas. Spraying under decks and patios is often the first sign of a skunk problem. The most common type of damage skunks can cause is known as “turfing.” Turfing is described as digging into the ground in search of food (typically for grubs and earthworms in people’s yards). It is not uncommon to find sections of your yard ripped up entirely by skunks. They also have the ability to spray at any time if a threat is sensed. 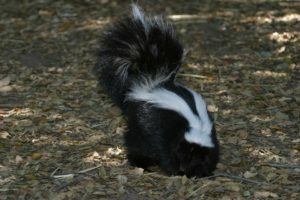 Often times, pets are the recipients of a skunk’s spray, causing even more hassle for homeowners. If you need skunks removed from your property, give us a call at 844-544-9453! Why Are There Skunks On My Property? Skunks prefer to live in forested areas, where shelter is plentiful and allows for a high chance of survival. Over time, as humans have come to urbanize the planet, skunks have been forced to adapt to the new urban environment. They have done so impressively, managing to survive and coexist with humans by using our property as means for shelter and foraging. 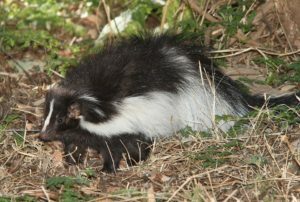 Skunks likely see your yard as a perfect location for locating their next meal – meaning they will likely dig up your yard in search of worms and the like. Buckeye Wildlife Solutions is Central Ohio’s leading skunk removal service. Call us at 844-544-9453 and solve your skunk problems for good!